Introduction to Debt Capital Market i.e. DCM. DCM is a desk which trades debt securities. Debt securities typically means government bonds, corporate bonds, CDs, municipal bonds, preferred stock, collateralized securities (such as CDOs, CMOs, CMBSs) and zero-coupon securities. Ask the veterans of Wall Street traders who deals in the most complex of derivative products or ask a neighbourhood vegetable vendor, about the most important thing in trading business. The plain and simple answer is- Price. So let us begin the journey to calculate your bonuses at DCM desk with ‘Price’ of bond. A bond mainly has 3 features. 3. The Coupon: The synonym of Interest. The following excel helps you calculate the price. It just says that if a company issues a 10 years bond with a coupon of 10% (which translate to 100 of annuity/PMT/annual Coupon). 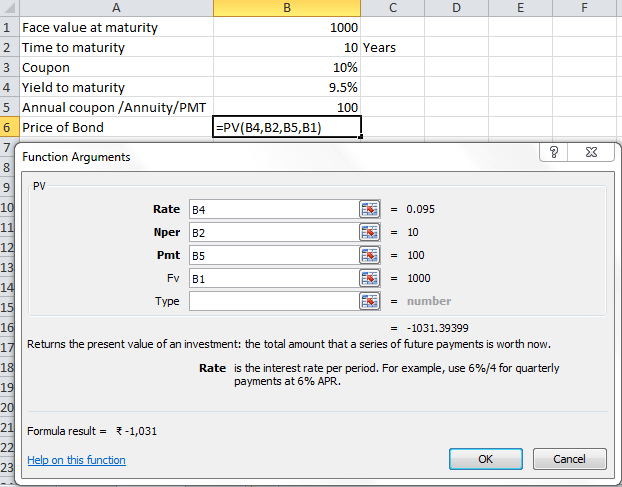 This cell B5 just tells you the Price of the Bond at the time of issuance using PV function. No surprises the Price of the Bond at the time of issuance is the issuance amount only (i.e.1000). Let us move to the ‘Trading’ part. One thing to remember about DCM Traders is that they think in terms of yield only. If a Trader has hung up the phone without saying this word then he must have been on a personal call. So what is Yield BTW? Let us first try a mathematician’s answer. Now we need to understand there are 2 types of Prices of bond: ‘Dirty Price’ and ‘Clean Price’. Dirty Price includes the accrued interest/coupon from the date of last coupon payment till the Trade date. Let us begin with a simple example. 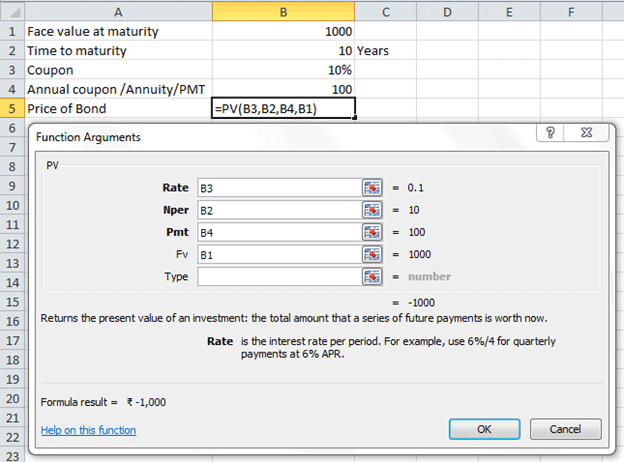 The following excel has a 10 years Bond with 1000 as Face Value, 10% coupon payment which falls due on 31 March of every year and the yield expectation is 9.5%.The transaction date is 30-June-2015.Trick here is to include the transaction date in the repayment schedule in chronological manner and put 0 (zero) against it as Pay-out. 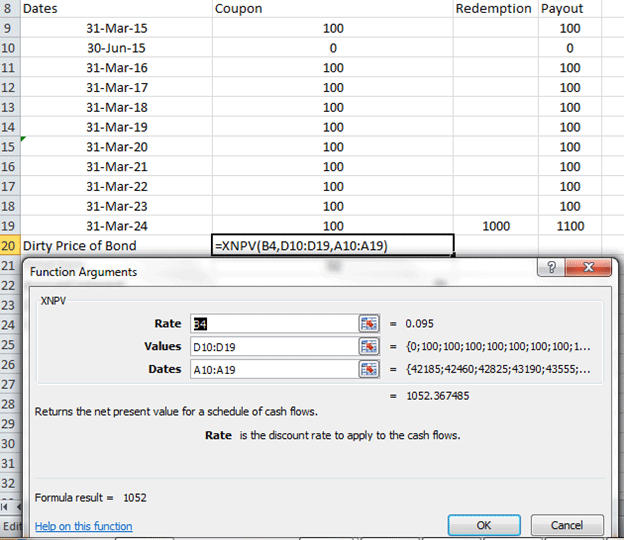 Since we have the exact date wise schedule so this time we should use XNPV function to calculate the Dirty Price of Bond. Rate =Yield to maturity of buyer (9.5%). Values and Dates should include the transaction date and final redemption date. 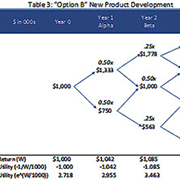 Now it is time to calculate the Accrued Interest which is the interest between 31 March 2015 and 30 June 2015 @ of 10% (Coupon Rate).The Accrued Interest is calculated as 27. So the Clean Price is 1052-25=1027. 3. 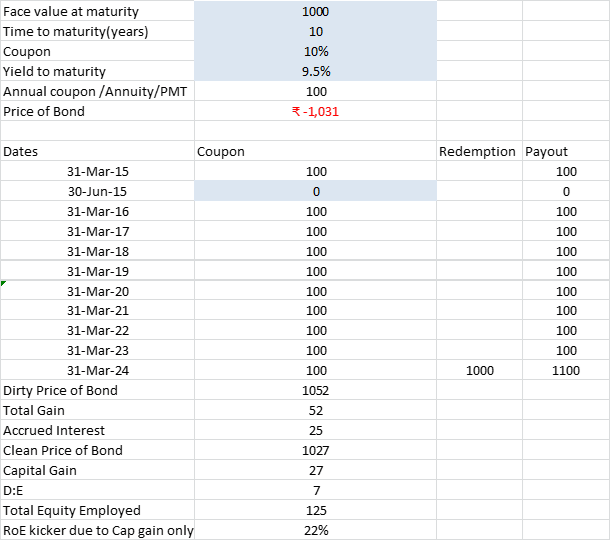 Net Interest Income (Coupon-Cost of fund). Capital gain is the most important number (read ‘bonus defining number’) to showcase the work desk has done for the year. Actually, it is the holy grail of DCM desk. It is what differentiates Bond from a tradition loan product. For first secondary trade of a bond, Capital Gain is the difference between the Face Value and the Clean Price. For follow on trades it is the difference between two Clean Prices. 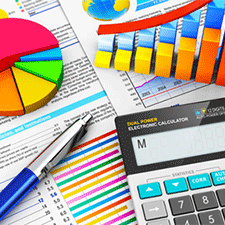 Another important number to showcase the performance is known as RoE (Return on Equity) or RoNW (Return on Net worth). Total equity employed can be derived from the total issuance size and the debt equity ratio (d:e) of the institution/bank. RoE in north of 15% is considered as a great number on the appraisal books.